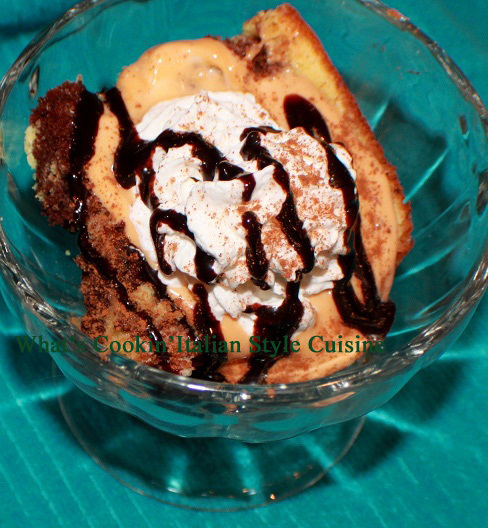 A dessert that is fit for an Italian King! Well my Italian King anyway. I just love the filling without eggs, you will love he creaminess of the mascarpone cheese in this filling. You can use my homemade cake recipe for Marble Cake by clicking here or proceed using a cake mix using the directions on the package. Here is the filling and directions. Prepare marble cake and bake in a tube pan to slice easy. 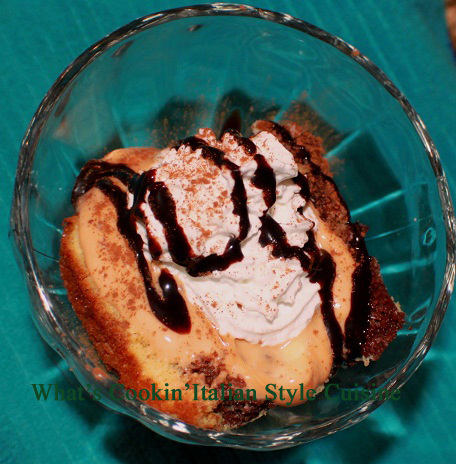 Place cooked sliced marble cake into a parfait dish or line a trifle bowl. In a small bowl, combine the coffee and liqueur; set aside. In a medium bowl, beat the mascarpone cheese, cream cheese, and confectioners' sugar until smooth, add a half cup of sour cream, (do not overbeat the cheese beat for around 2 to 3 minutes until smooth). Prick the top of the cake and drizzle a little of with coffee mixture on each piece of cake or if using the tube cake slice in half first and drizzle on both cut. Spread cheese mixture on top. Top next with whipped cream and chocolate sauce, dust with unsweetened cocoa powder. This looks so delicious. Yummy! Love this, Claudia. An excellent twist on a great classic! (I have trouble finding lady fingers and I'm too intimidated to make them.) This is for me! I really shouldn't be dreaming of luscious desserts before breakfast. Yum! A perfect dessert to make! Way big yum. this is my Hubby's favorite dessert. He'd be all kinds of happy if I made it for him! Oh my, oh my, oh my - delizioso! What a great use for the trifle dish! Love it. Love the use of the marble cake!! !